Micro-Epsilon’s optoNCDT 2300 is a world first in high speed, high accuracy laser sensor technology. As with all of Micro Epsilon’s laser sensor family, the optoNCDT 2300 is a self-contained laser displacement sensor, which requires no separate controller yet still provides an extremely high measuring speed of up to 50 kHz and resolution of 0.0015% FSO (Full Scale Output). The sensor is therefore ideal for high-speed dynamic applications such as vibration measurement and profile scanning of uneven, rapidly changing surfaces. Although competing sensors claim to offer similar measuring rates and resolution, the new optoNCDT 2300 is the only sensor that offers a 50 kHz measuring speed and an integral controller. Unlike many competing sensors, the optoNCDT 2300 achieves high resolution and high measuring speeds without any averaging. Additionally, the sensor measurements are output directly from the sensor via Ethernet, EtherCAT or RS422. The sensor uses Micro-Epsilon’s new A-RTSC (Advanced Real Time Surface Compensation) technology, which enables the sensor to automatically compensate in real time for difficult-to-measure surfaces. A-RTSC is a further development of Micro-Epsilon’s patented RTSC feature, which, when combined with high-speed software algorithms, dramatically reduces signal noise at high measurement speeds. When users need to measure against a rapidly changing surface, they ideally require a sensor that is able to automatically adjust the laser pulse duration (or laser on time) of the sensor to give them the optimum exposure time on the CCD for that particular surface. This, in turn, provides a higher accuracy measurement due to lower noise level on the output signal. This is the basis of RTSC and helps in achieving resolutions down to 0.1µm and linearity down to ± 0.4µm for the 2mm measurement range. Data output is via Ethernet, RS422 or EtherCAT. Similar to the optoNCDT 1700 laser sensor, the optoNCDT 2300 has a user adjustable measurement rate. This unique Micro-Epsilon feature enables precise and stable measurements on low reflectivity surfaces, for example, matt black or shiny metals. Rather than having a fast exposure time resulting in low light levels on the CCD line, the adjustable rate enables the user to slow down the measurement rate, which then enables a longer time interval for CCD exposure, resulting in a more stable, higher resolution measurement. No other laser sensors offers this feature. The optoNCDT 2300 can be operated in several measurement modes: in standard mode for displacement measurement of diffuse reflecting materials or with a special alignment mode to measure directly reflecting surfaces. Furthermore, the laser triangulation sensor can be used for one-sided thickness measurement of transparent materials (multi-peak evaluation). Therefore, the software provides a comprehensive materials database that is editable and expandable. The A-RTSC (Advanced Real Time Surface Compensation) feature is a further development of RTSC technology and improves the surface compensation capability. This means the sensor is not influenced by rapidly changing surface reflections and provides stable measurement results. 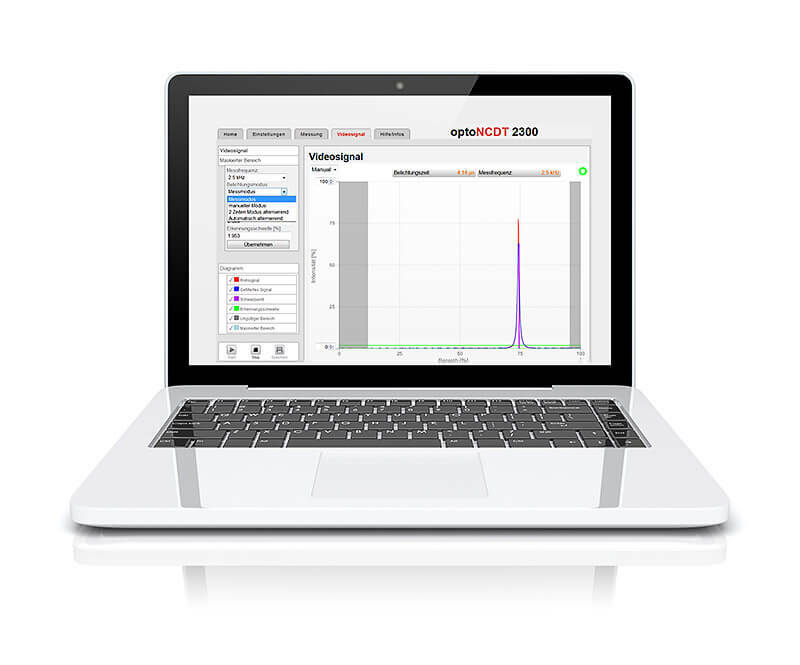 All optoNCDT 2300 laser sensors are operated using an intuitive web interface. This web interface can be accessed via Ethernet, enabling the user to make settings for the processing of measured values and signals, e.g. peak selection, filter and masking features for the video signal. 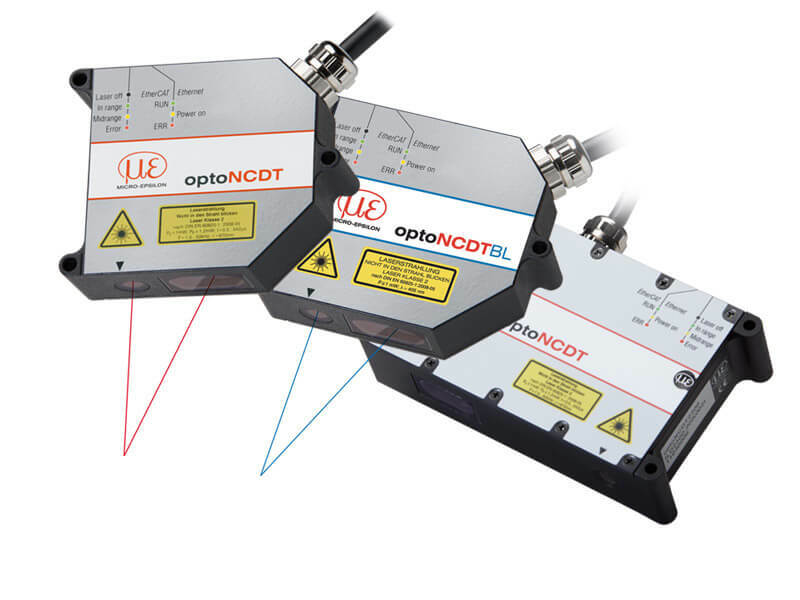 The optoNCDT 2300 is the high performance version of Micro-Epsilon laser triangulation sensors and offers an adjustable measuring rate of up to 49.02kHz. The optoNCDT 2300 is used for high speed applications such as the monitoring of vibrations or measurements on challenging surfaces. Due to their high resolution, sub-micrometre measurement accuracies are possible.